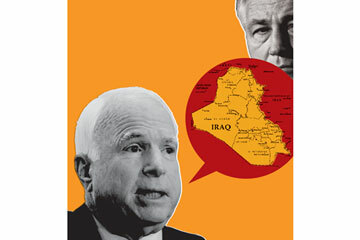 What have we, and Senator John McCain, learned about Iraq and Afghanistan? There was a time when John McCain was a reasonable man. It was a while back, but I remember it well. It was, specifically, about seven or eight years ago, when we were in a terrible mess in Iraq. There were two options on the table at that point: stay the course or leave. McCain understood that both were wrong. The Bush Administration's path had, from the start, been criminally stupid. Many top members of the uniformed military had thought the war a bad idea, and even those who supported it were appalled that the dreadful Donald Rumsfeld had formulated a plan without a final phase of operations--Phase IV, in military parlance--to stabilize the country and hand it back to the Iraqis. But there we were, stuck, and McCain believed we couldn't just leave. His main concern was that we not hand al-Qaeda a victory. There was also a moral consideration: having wrecked their country, we owed the Iraqis a fighting chance to rebuild. And so McCain was one of a handful of officials searching for answers in 2005 and 2006. The answers were found at Fort Leavenworth, where General David Petraeus and a formidable team of military intellectuals were designing a clever and humane way to do Phase IV. This became the counterinsurgency doctrine that worked well enough to calm Iraq--but not so well in Afghanistan. I was thinking about this as I watched McCain's rude badgering of Chuck Hagel, the nominee for Secretary of Defense, at Hagel's confirmation hearing on Jan. 31. McCain wanted to know, yes or no, if Hagel regretted opposing the 2007 troop surge in Iraq that brought Petraeus' tactics to the battlefield. We've all now seen the footage of McCain steaming like a beady-eyed madman and Hagel's fumbling response--indeed, it was one of more than a few fumbling responses by Hagel, to questions both friendly and rude. This was a dispiriting event on several levels. Hagel stepped away from the moderate, realistic and candid positions he had taken in the past. He allowed himself to be hectored into submission about his criticism of the Israel lobby, which does indeed bully politicians into "dumb" acts like meaningless expressions of protest of Iranian behavior that Hagel refused to vote for, and on far more serious issues like Israeli settlement expansion in the West Bank. But Hagel's worst moment came with McCain. He was both clumsy and disingenuous. The truth is, McCain was right about the surge, but it was a reflexive correctness. McCain never really understood counterinsurgency--I suspect he thought it was mostly about bringing in more troops--but it seemed to be working. And then he pushed for more, seeking victory, by which he seemed to mean permanent occupation rather than merely the stability that would enable us to leave honorably. Hagel, on the other hand, came to understand a larger truth: the near impossibility of going to war in places like Iraq and Afghanistan--and, prospectively, Iran, another country that McCain has blustered about bombing.